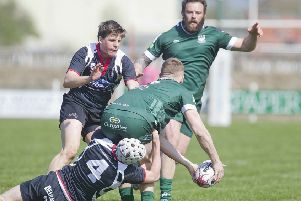 The Reivers Ladies welcomed Boroughmuir to Tweedbank on Saturday, knowing nothing but a win would be acceptable as they chase down Linlithgow at the top of the Premier League. From the whistle, the Reivers picked up from where they left off last week and quickly got on to the scoresheet, as Sara Robson hungrily snapped up an early opportunity. Not to be outdone, Sara’s sister Ashley was next to find the net, as pressure from the Reivers won a penalty corner. The skipper made no mistake with an emphatic strike from top D, to make it 2-0. There then followed a period of great pressure from the Reivers, with several more penalty corners being won. However, the home side couldn’t manage to convert, keeping the animated local supporters on the edge of their seats. Just before half time, the visitors were unfortunate to lose a player to a blood injury when Lauren Grant drove into the D, working space for a shot, only to see it deflected up to the head of the helpless defender. After the break, the Reivers knew they could push on and put the game out of sight, and this they did with some fantastic pressing of the opposition. From one such play, Denise Fairbairn, back to her best after injury, won the ball on the right and found skipper Ashley Robson in space with a beautifully weighted pass and the latter finished in style. The Reivers were now playing with great confidence and vision. They moved the ball quickly around the pitch, with Lauren Grant and Rachel Shiel working tirelessly both on and off the ball to create space through the midfield, allowing Danni Walker and Emma Grieve to exploit this from deep to great effect. From another clever penalty corner, the ball was drag-passed back to Emma Grieve on the right and she made no mistake in striking the backboard for a well-deserved fourth goal. Boroughmuir now defending in numbers, tried valiantly to make it difficult for the home side. However, a confident Reivers team was in full flow, working hard for each other. The fifth goal came from the industrious Lauren McLean after terrific interplay by Elena Lunn and young Holly Shepherd down the right. Finally, Sara Robson, working tirelessly up front, rounded off the scoring by grabbing her second, and the Reivers’ sixth, with three minutes left on the clock. This was another fine all-round performance from a team which has found the form it showed last year just at the right time, fighting back from a slow start to the season, with some assured and quality performances – from the experience and guile of Janet Jack, Claire Townsend and Jackie Wilson, at the back, to the youthful exuberance and raw talent of Holly Shepherd and Holly Grieve who both improve with every outing. This win means all roads will lead to Linlithgow this Saturday, 3pm passback, for the Reivers’ final game of the season. A win there and the Tweedbank outfit will clinch the league and secure back-to-back Premier League titles, which would be a fitting reward for this terrific squad of players. However, they know there is still work to be done.